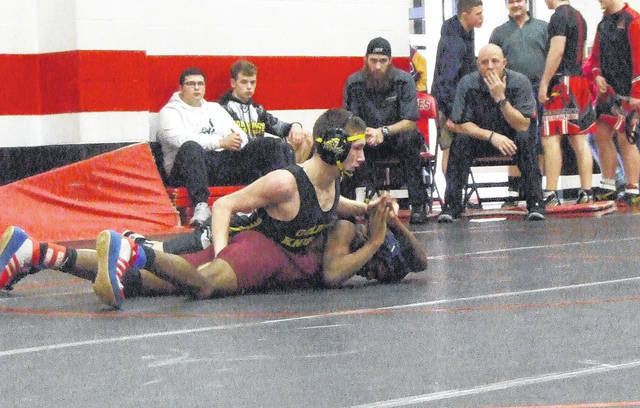 Austin Amens was one of 12 Northmor wrestlers to advance to the district wrestling meet, as he placed third in the 120-pound weight class. Mount Gilead’s Tyler Cooper wound up finishing third at 220 pounds to be one of nine Indian wrestlers to advance to districts. Tanner Jones pinned his opponent from Centerburg to qualify for the district meet. Northmor advanced all 12 of their wrestlers to districts in winning the Cardington Division III sectional with 206 points on Saturday. The Knights earned the title in the 13-team meet, while Pleasant was second with 197 points and Mount Gilead took third with 156.5. The host school finished 11th with 28. Northmor won five third-place matches to Pleasant’s two. The Knights also won all three matches between the two schools in the final round — two in championship matches and one in a third-place match. After the meet, Carr gave credit to some of his less-heralded wrestlers, citing 138-pounder Eli Davis (fourth) and 170-pounder Wyatt Lessick (third) for having good tournaments, as well as mentioning that 182-pounder Austin Wheeler claimed third place by defeating a wrestler who’d beaten him in the first round. Aaron Kitts (132), Conan Becker (145) and Conor Becker (152) all earned championships for the Knights. Kitts and Conan Becker pinned their final round opponents, while Conor Becker won by major decisions. Three more Northmor wrestlers took second place. Gavin Ramos (126) fell by a 7-5 decision to Northridge’s Klay Reeves, while Tony Martinez fell to Northridge’s Forest Belli at 160 and Tyson Moore was beaten by Mitchell Hurlbut at 285 pounds. Dale Brocwell (106), Manny Hielman (113), Austin Amens (120) and Lessick all won by pin in their third-place matches, while Wheeler (182) won by 3-2 decision. Davis (138) placed fourth to round out the Knights. With the full team moving on to districts, Carr noted that his team’s practices probably won’t need to be altered leading into this week’s action. 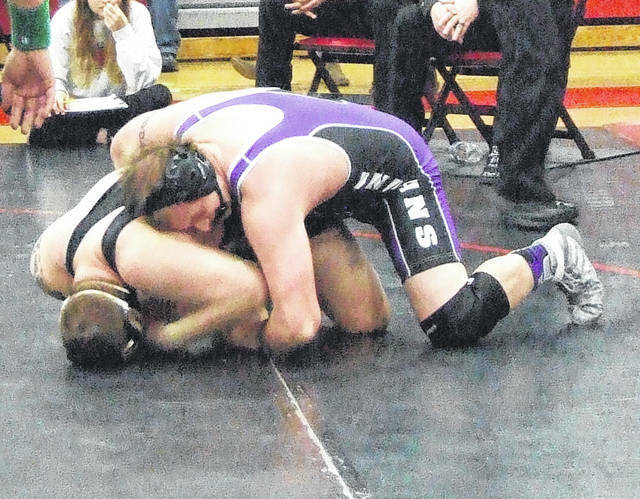 Mount Gilead also had a successful day at Cardington, advancing nine wrestlers to districts. 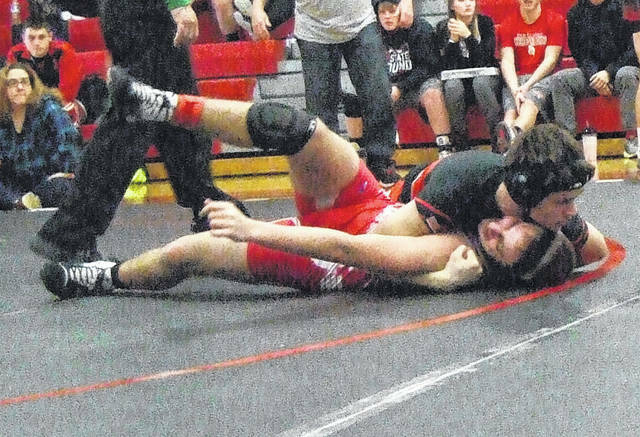 Joshua Sullivan won the 113-pound weight class via pin over Pleasant’s Adam Rajkotwala, while both Brandon Strickland (170) and Hunter Trimmer (182) took second place. Nate Weaver (132), Andy Williamson (152), Tristan Stewart (182), Tyler Cooper (220) and Kaleb Fisher (285) all placed third, while Jesus Rubio claimed fourth place. Also, both Josh Brown (138) and Jake Simmons (145) took fifth place to be district alternates. Cardington had one district qualifier in Tanner Jones, who finished fourth at 152 pounds. Skyler Streich (160) and Devin Speck (285) both were fifth to be district alternates. Highland took sixth place at the Division II Licking Valley sectional wrestling meet with 96 points. The Scots had four district qualifiers in the tournament, including one champion. Christian Miller won at 132 pounds, finishing with a second-period pin over Brandon Bart of Buckeye Valley. Bryce Schott took second place to Hartley’s Michael Petrella at 106 pounds, while Ryan Kelley (160) and Jonathan Sparks (170) both finished fourth in their respective weight classes.